Every Christmas my fella puts a Lush giftbox together for me, complete with a Knot wrap. This year he decided to make one for my birthday too. It’s been a while since then and I’ve made my way through the full box. I generally don’t share things like this, but since we both love Lush I wanted to review the items and share them with you. When I leaked a few sneak peaks of the Halloween Lush times on Twitter (soz Lush HQ), everyone was perplexed by the Pink Pumpkin. I mean, let’s be honest it does look a bit funny. Despite this, the Pink Pumpkin smells amazing! 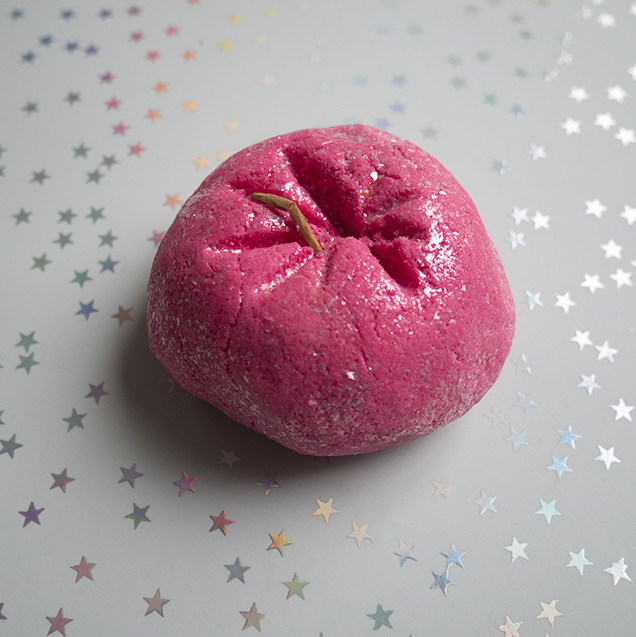 Unlike the Sparkly Pumpkin, this Pink version doesn’t have that typically festive spice scent. It has a citrus buzz, without coming off overpowering. It turns the water a slight shade of pink, nothing too intense like it’s Comforter cousin. However I must admit, after using half a bar the bubbles didn’t last too long. The scent did stick around but I feel as if Lush bubble bars no longer keep old their ‘hollywood bubble bath’ promise. I’ve tried this one before and I can say it’s one of my favourite bathbombs since Lush rebranded. The intense colour and oozing glittery fountain that comes from this product makes you feel as if you’re bathing in an enchanted fairy pool. Of course, Lush glitters are now completely biodegradable so there’s no need to worry about washing all the luster down your drain once you’re finished. But what about the scent? I would say the fragrance isn’t for everyone because it’s very different to your typical sweet and citrus favourites. 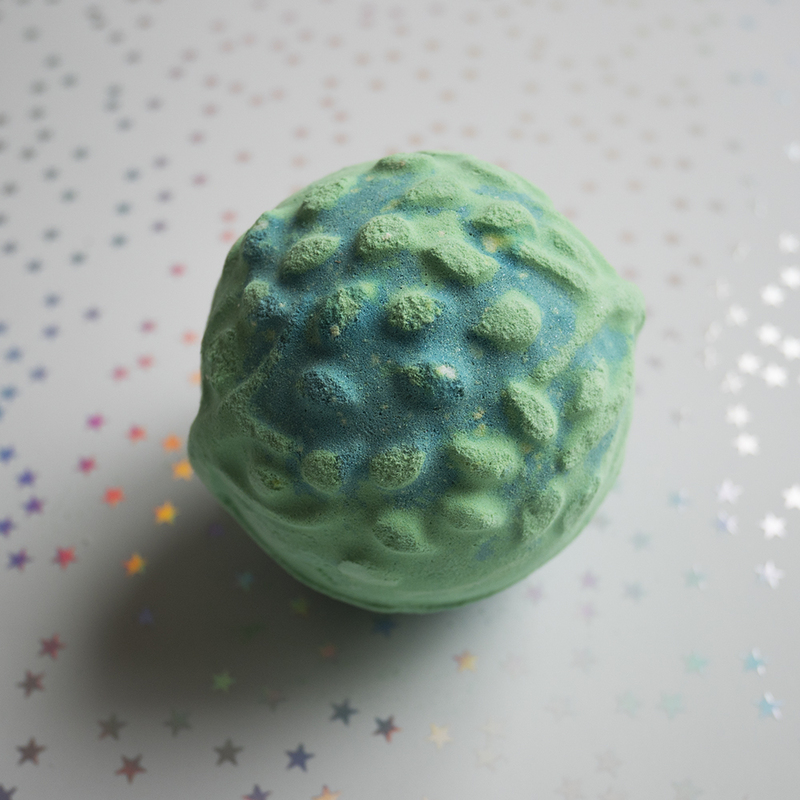 The Guardians of the Forest bathbomb does feature lime oil, but it’s over shadowed by musky oakmoss absolute. The scent is very unique and personally I love it, but Snow Fairy fans may find this a little too intense. Pumpkin bathbomb is an absolute classic and an underrated one at that. 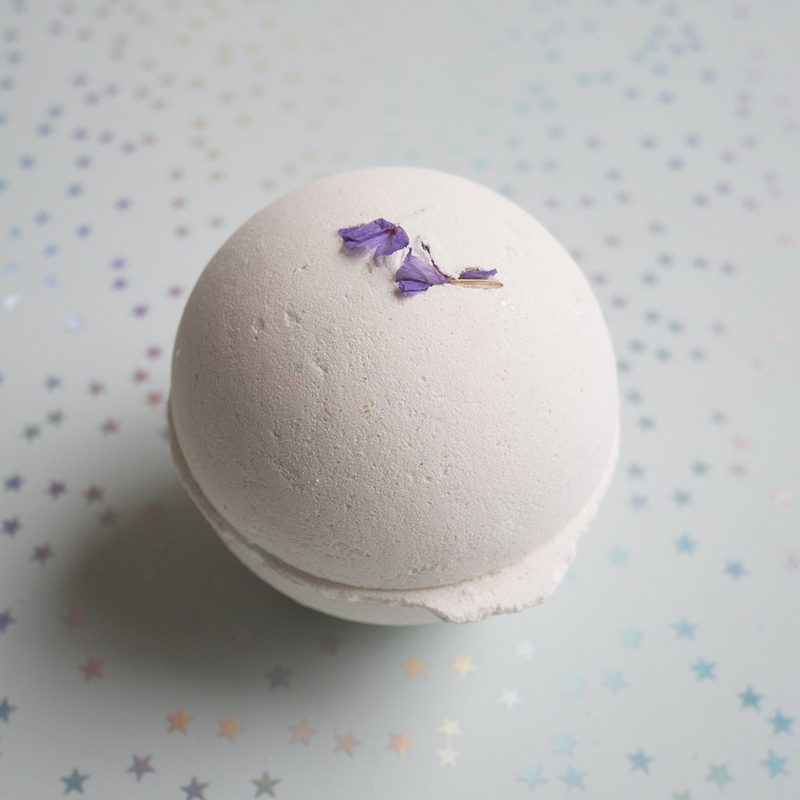 It has a subtle sweet fragrance that is lovely when used on it’s own and amazing when paired with the Sparkly Pumpkin bubble bar (the original, not the pink one). It’s a relatively fast fizzer with no foam but that definitely doesn’t mean it should be overlooked! What it lacks in instagrammability, it makes up for with a gorgeous smell that lingers on your skin for hours after. 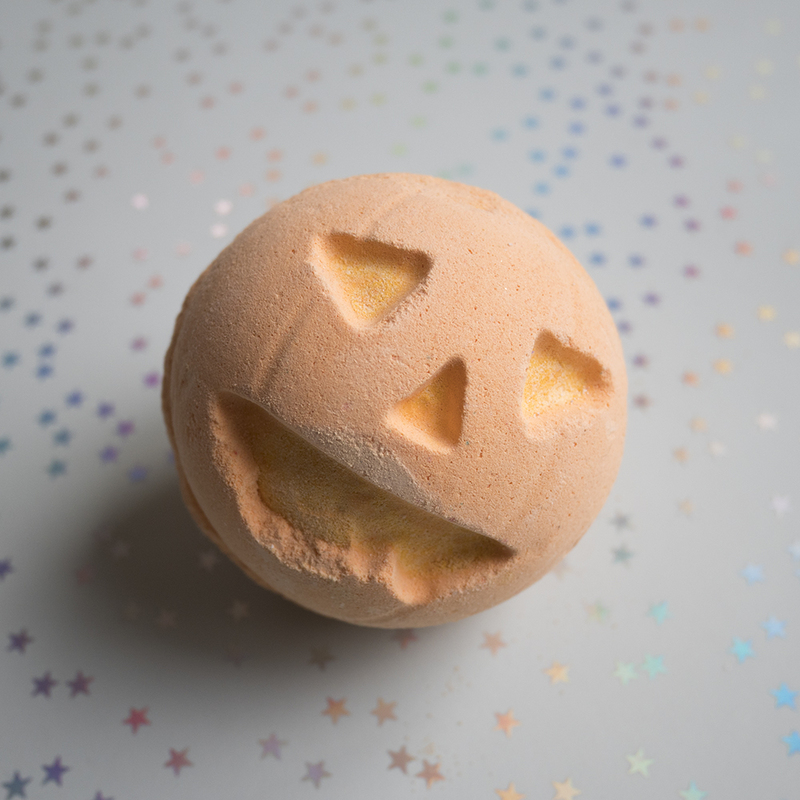 I do think that people go in with high scent expectations with the Pumpkin bath bomb, mainly because the staff are quick to tell you it’s PSL scented. It isn’t. It’s more like spiced baked goods, which is amazing, but if you go in wanted rich PSL fragrance you’ll no doubt be disappointed. My fella was a little disappointed that this arrived broken, but anyone who has seen these in store will know that they are a nightmare to keep safe. Lotus has a beautiful design and it’s a little unrealistic to assume something so delicate can survive in the post. This is no longer an in store bath bomb but they’ve been online for a while in the kitchen. I have a feeling that due to the delicate design of this one, it probably won’t be coming back any time soon. The petals on the Sacred Lotus do snap off, but in the grand scheme of things it doesn’t take away from the gorgeous scent and amazing foam trails. This was the most beautiful bath bomb in the box by a long shot. The contrast of purple and yellow foam creates amazing swirls on the surface of your bath water. 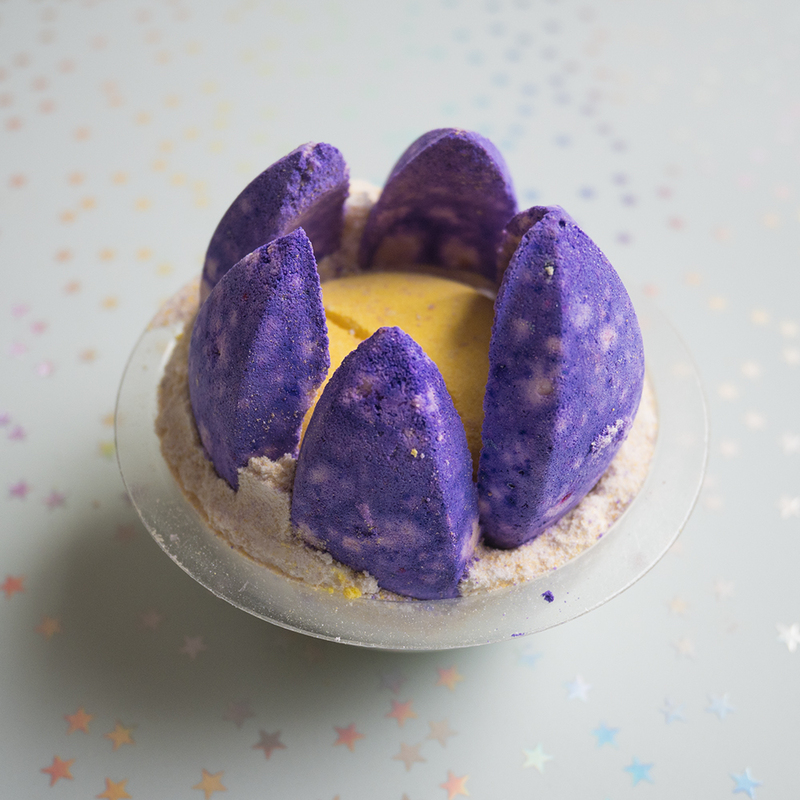 Lush have used their signature cream of tartar cocktail to make sure this bath bomb puts on a show. Sacred Lotus also holds the holy trinity of essential oils – tonka, jasmine and neroli. These are my favourite scents combined into one bath bomb. Imagine my joy! This reminded me of Nea Worry Pas at first, which I haven’t had in years and miss dearly. It was also a total curve ball gift because I didn’t think my fella knew what the Lush Kitchen was! The scent was floral but definitely not subtle. As soon as this bath bomb hits the water your bathroom turns into a field of wildflowers. I could see my water turning a soothing milky colour when all of a sudden vibrant apple green poured out, releasing dried flower petals that were hidden inside. Of all the bath bombs in the box, this was the most special and I felt as if my skin had been thoroughly moisturised upon stepping out of the bath. Another reason I loved this was because I’m a huge neroli oil fan! They say you’re attracted to the essential oils you need the most and honestly I believe it because neroli always gives me a much needed mood boost. I love the smell of lush products! It can always change the mood of the day for sure. What a brilliant present, I love the choices! I tried a pumpkin for the first time last week, it was lovely. I love the look of the pink pumpkin too. I also ordered a lotus and mine amazingly arrived intact! I love Lush-it is so easy to fall in love with their products. These bath bombs look great- I loved Ylang Song Bath Bomb and Sacred Lotus Bath Bomb. OMG the pink pumpkin is so cute, so is the sacred lotus! I think I will check if the product of Lush available here in Belgium. Nothing can beat taking a bath with the sweet fragrance of bubble bars. Wow! Very luxurious bath bombs here. I think despite its broken condition the lotus bomb seems to have come out on top with regard scent and bubbles. I love lush products especially their hair products. These look great and I bet they smell amazing. It’s too bad I only have a shower and no bathtub. The sacred lotus very cool and I would love to try it! Your fella is sweet to gift you such amazing products every year! 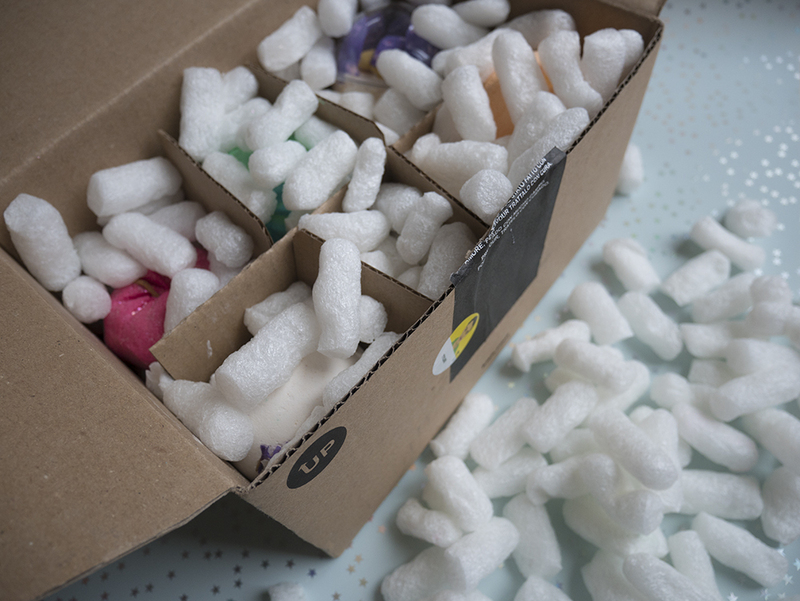 Ooh I’m very jealous, I love Lush and a Lush delivery always makes my day! These all look great! This is a great gift. The smell of Lush product is amazing. I think I would probably use the Kitchen exclusive bomb:-) Great post! What a very lovely idea.Guardian of forest and pink pumpkin look so cute. This would be great a presents for this coming holidays. A mystery box full of beauty goodies is such a fabulous gift! My favourite would probably be that bath bomb which releases flower pieces, althought cleaning the bath tub take a bit longer after bath :D. I love neroli oil as well. I love these bath bombs, but I never purchased anything from Lush as i have very senstive skin and wonder if I will come out in a rash. But my sisters love it and these all look like great gift ideas. Oh no! I know quite a few people who have to swerve the bicarb for the same reason. The bath oils might be more up your street. They’re made with essential oils and are more gentle on the skin. These look amazing! I would love to try the Lotus one. It’s amazing that it arrived in the condition it did, even if it was a little broken.